TBQ'S Book Palace: [Kame's ARC Review]: "I'll Be Home for Christmas"
[Kame's ARC Review]: "I'll Be Home for Christmas"
It is a few days before he deploys and Vic Carponti can’t shake the feeling that this deployment will be different. He knows his deployment will be harder on his wife, Nicole as it will be her first Christmas since her father died. All she wants is her husband home for Christmas. “I’m glad you’re here,” he whispered, holding out his hand for the baggie. He took a deep breath, then dumped the contents onto his lap. His dog tags jingled against his wedding ring. He maneuvered the plain gold band onto his finger then managed to use his thumb and pinky to get it back where it belonged. Nicole hadn’t noticed but it was a small victory for him. It felt right having this ring on. One thing I like about books in a series is you get to see events from many points of view. 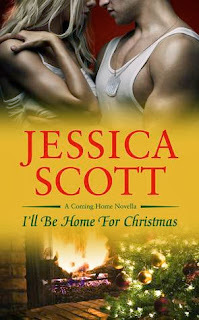 Fans of Jessica Scott’s Because Of You will be happy to see the events of the deployment from Carponti’s view. We met Carponti in Because of You so what can we learn in a novella with Carponti the main character? Carponti does have his funny moments but we realize that while on deployment the laughs are more to keep his fellow soldiers’ morale up. There are times he is more serious and extremely protective of his wife. His intense love for Nicole is on every page. Nicole’s character shows us the view of a wife of a deployed soldier, sleeping in his shirt wearing his cologne, and sleeping with the computer next to the bed; I was biting my nails right along with her at times. This book had a ton of sweet moments and some surprises for me too. It is a perfect complement to Because of You and could be read either before or after. This is more than a Christmas novella, it is a must read if you are a fan of Carponti. It’s hard to imagine but I actually love this character more after reading this novella. *Note: The quotes used belong to Jessica Scott; Kame and TBQ's Book Palace do not claim them. Thanks for the review, Kame! :) Great quotes--I couldn't narrow down my favorites. LOL There were just too many great ones to pick from!